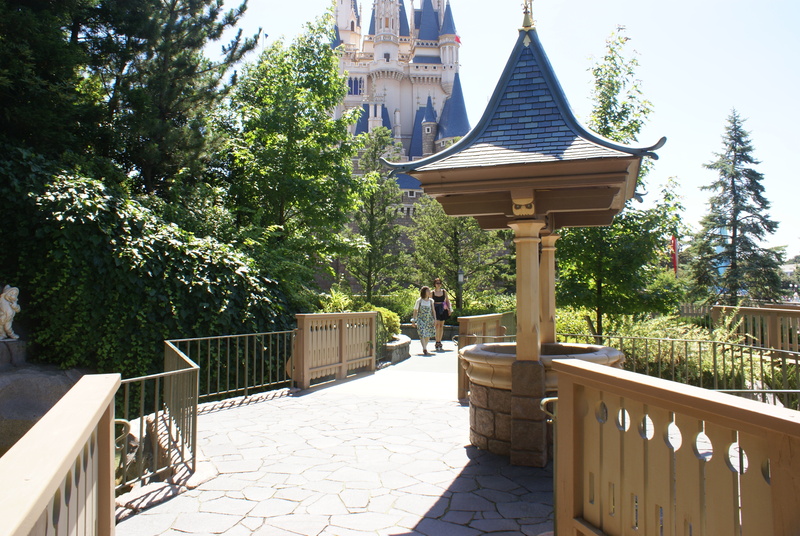 Its totally crazy to think that its been almost 2 whole months since I got back from our trip to Japan, and even crazier to think that there’s so much from the non-Disney side of my trip that I haven’t shared! 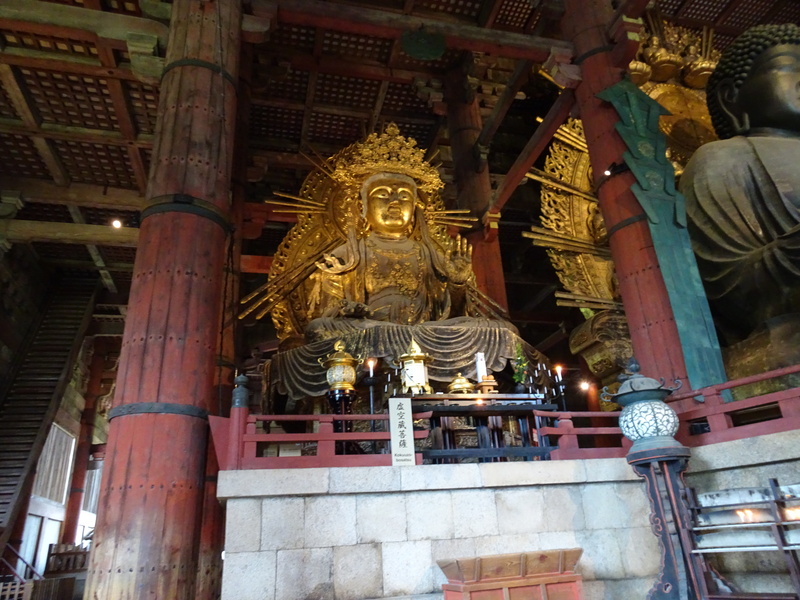 We had such an incredible time travelling around Japan, so today I’m just going to share a few more of the sights and tourist-y bits that we squeezed into our trip while were weren’t rushing around on the trains! 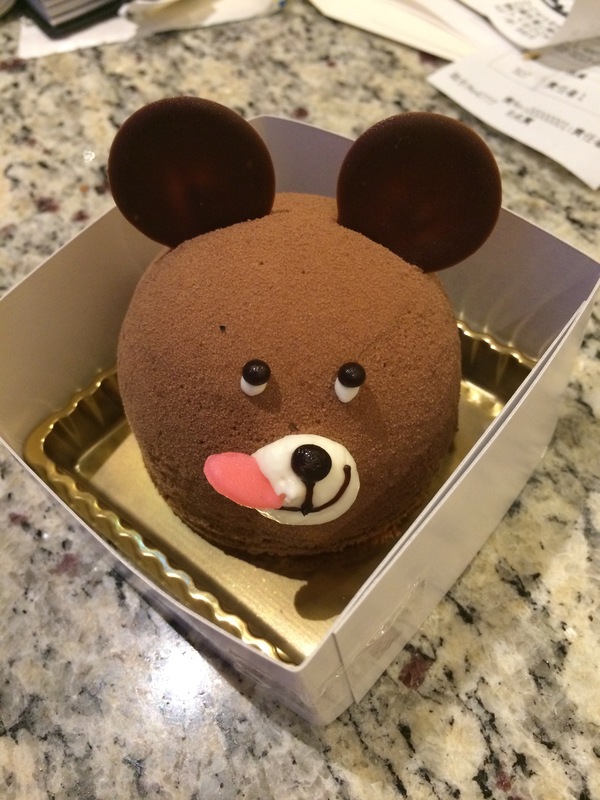 After leaving Disneyland, we had another day in Tokyo, primarily for the purpose of going to an animal cafe. 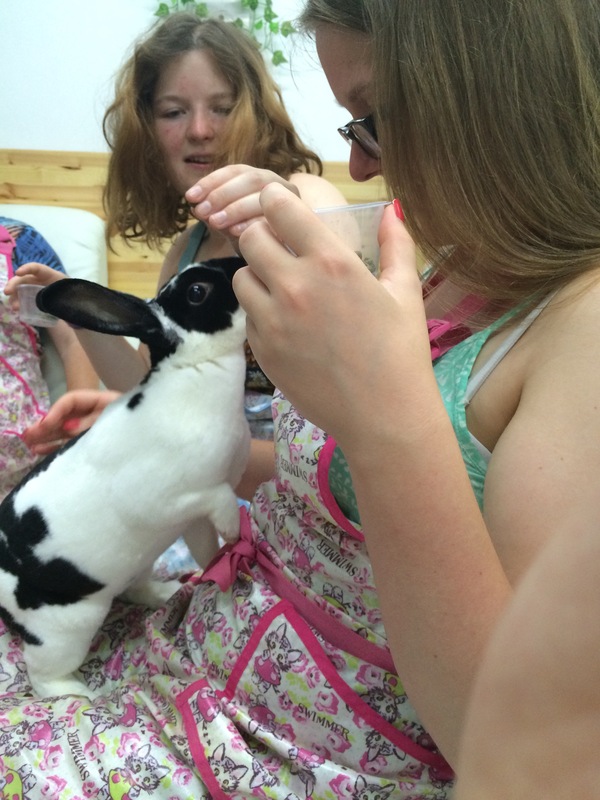 If you’re not familiar with the concept, due to the fact that many Japanese people are unable to keep pets, ‘cafes’ have popped up all over the place where cats/dogs/rabbits/goats/owls are set loose for guests to play with for their paid-for time slot, crazy right?! Well we still had to go to one, and we chose a bunny cafe, specifically Mimi Bunny, which was on the 8th floor of what seemed to be a block of flats, but with a business on each floor. After changing our shoes, washing our hands and being fully sanitised, we paid for half an hour of bunny bliss, during which two gorgeous rabbits were let loose in our little area for us to feed, stroke and generally coo over. 100% worth it! 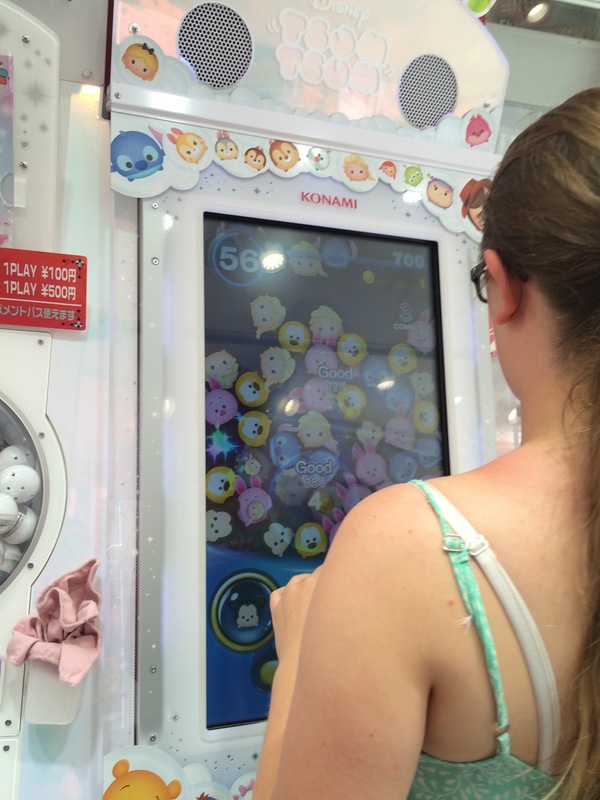 I was also pretty excited to come across a Tsum-Tsum arcade game in the street, so obviously had to give that a go (or two). After leaving Tokyo we headed down to Osaka and set up base on the 41st floor of the tallest building in the city; the hotel lobby was on the 19th floor, and the views were incredible! 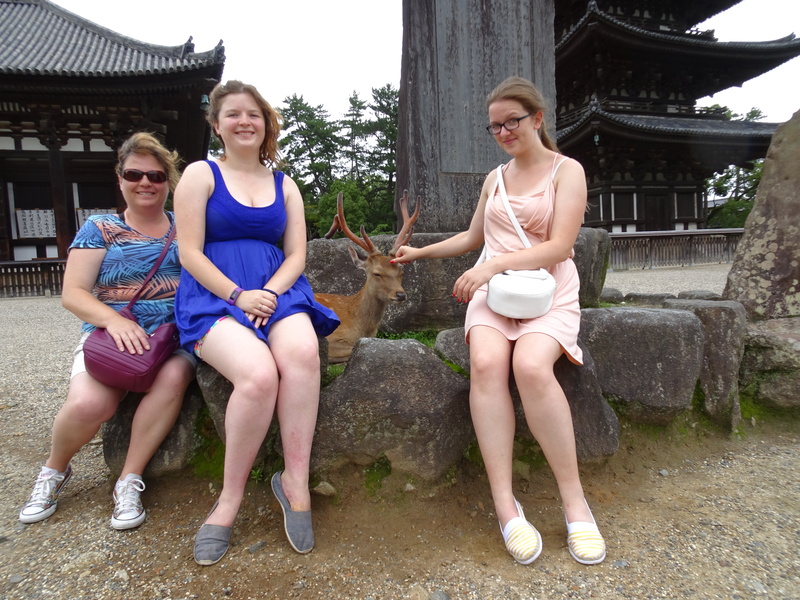 From Osaka we could anywhere by the train network, so we headed down to a town called Nada, famous for the deer that roam free around the main tourist areas, including inside the temples! You can buy biscuits to feed them too, which is a good idea if you don’t want them to help themselves to the contents of your handbag, or even your map! 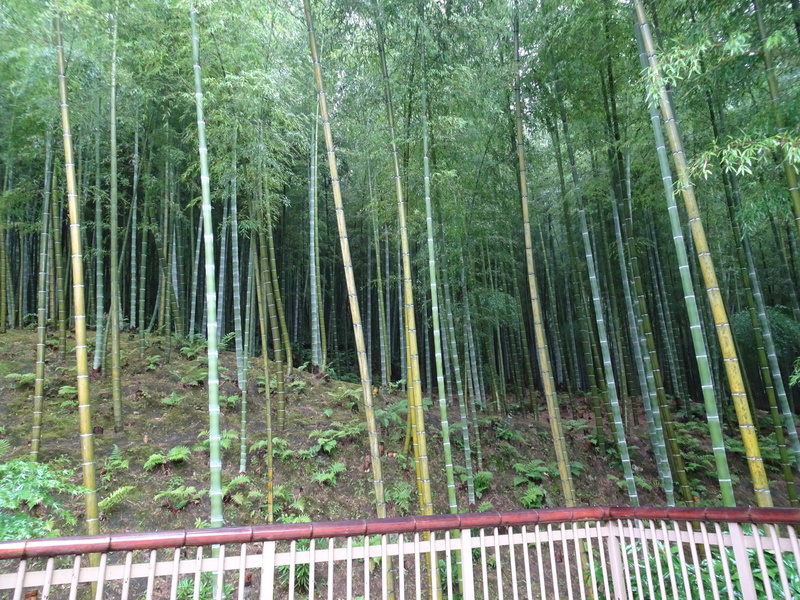 We also squeezed in a few more tourist hotspots, from a bamboo trail and zen gardens, to a shopping trip in Daiso – the Japanese 100 yen store (that’s 55p! 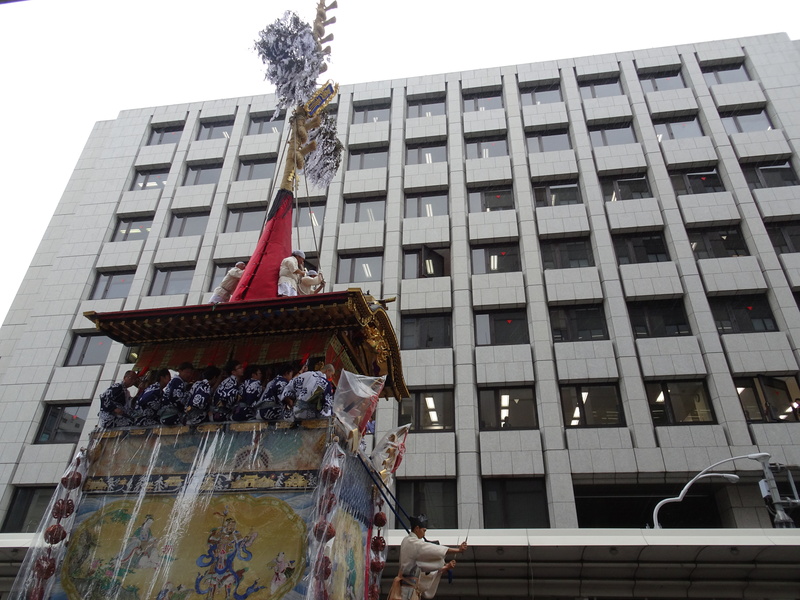 ), which we had a blast in! 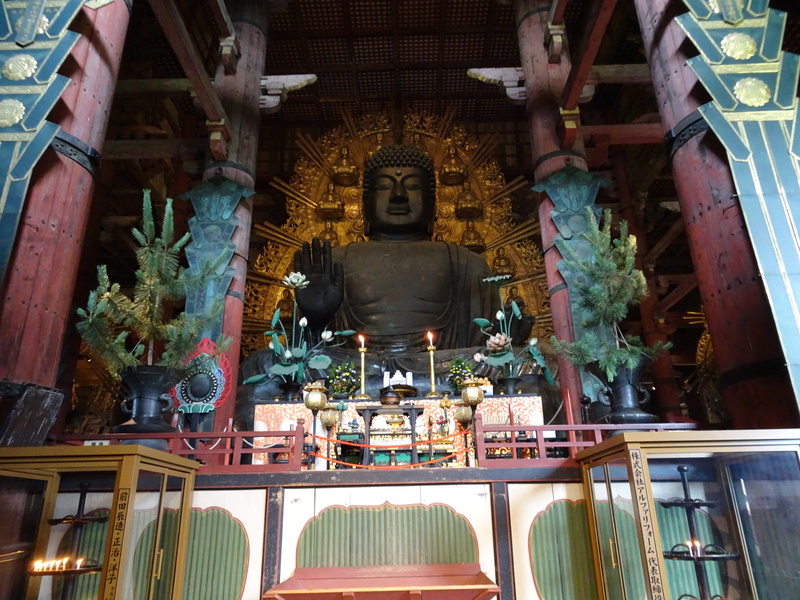 Our whole trip was such a unique experience, from shopping and the train system to the cultural attractions and the food. 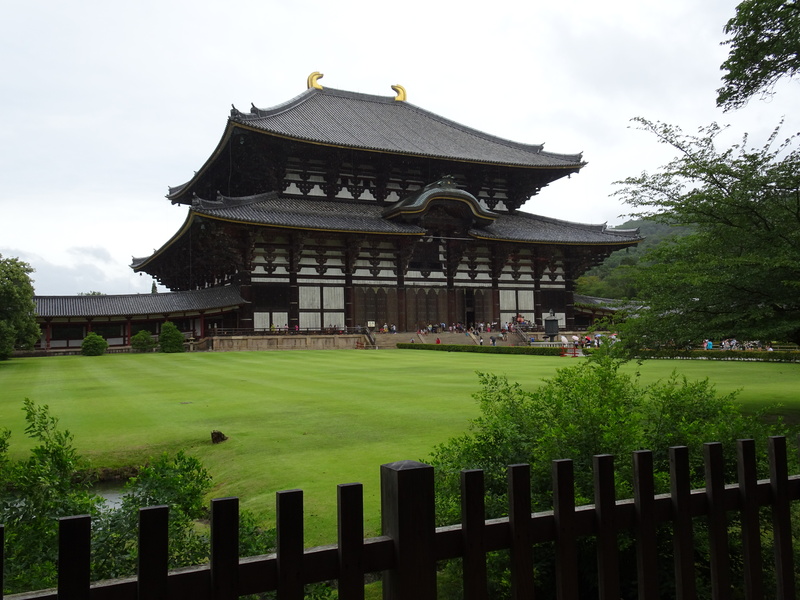 If you’ve ever thought about visiting Japan, I have two words for you: DO IT. 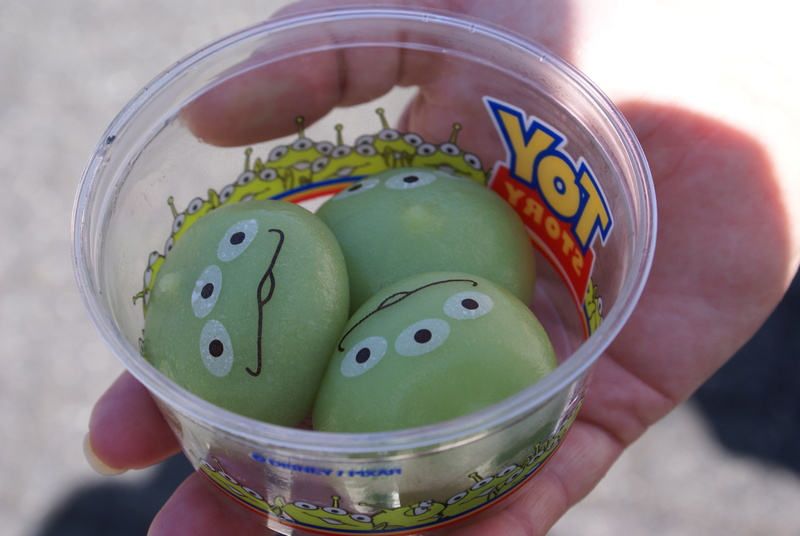 For me, the only thing that was going to be more exciting than my Tokyo trip, was all the wonderful goodies I knew I would find in Japan. I packed the bare minimum (which by my standards is still probably more than anyone else) so I could fill my case to bursting with amazing ‘stuff’ to bring home, and I think I did a pretty good job.. This isn’t even all of it! BUT a fair few of these goodies are for giveaways, so its not all mine, but I’m going to share what I did buy just for me! 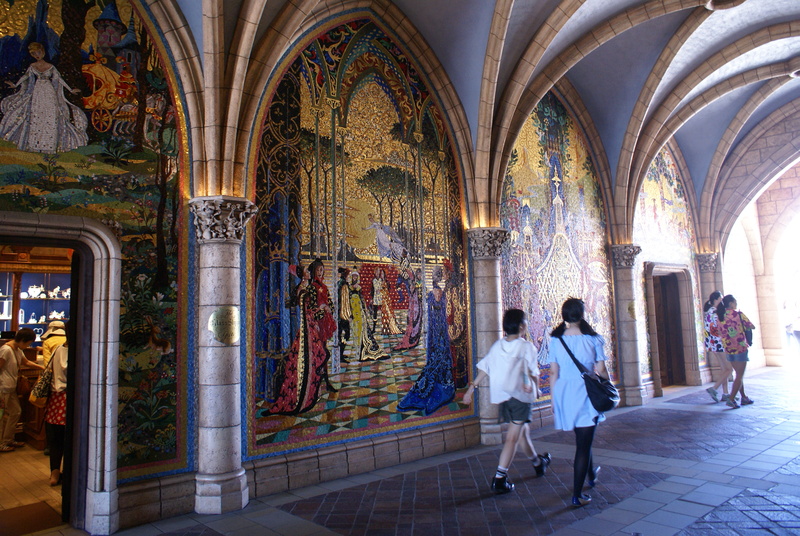 Nanoblocks have a small following here in the UK, but they were everywhere in Tokyo Disneyland; every character you could imagine in teeny tiny Lego-like building blocks. 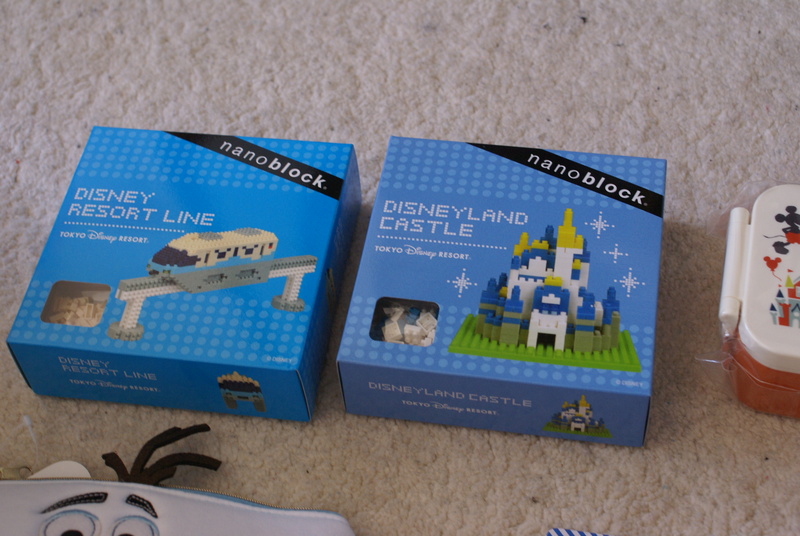 I was going to resist, but when I saw the castle I couldn’t help myself, and because the Tokyo Monorail was just so darn cute, I ended up getting that one too, and I’m really excited to give building them a go! Next, the wearable goodies! 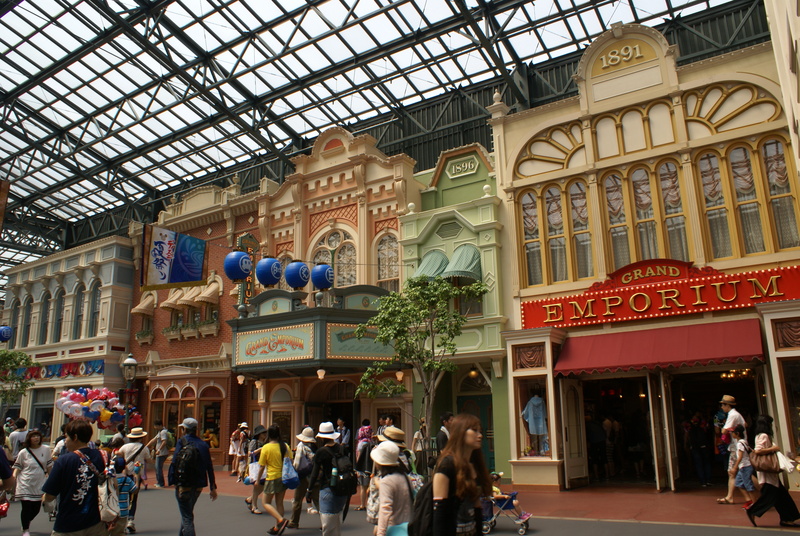 The Japanese really go all out when they dress for Disney, and the range was endless! From the parks, I got myself a pair of sparkly Minnie ears, a Minnie scrunchie, the amazing LGM ears, monorail socks, and Winnie the Pooh clip-on ears. 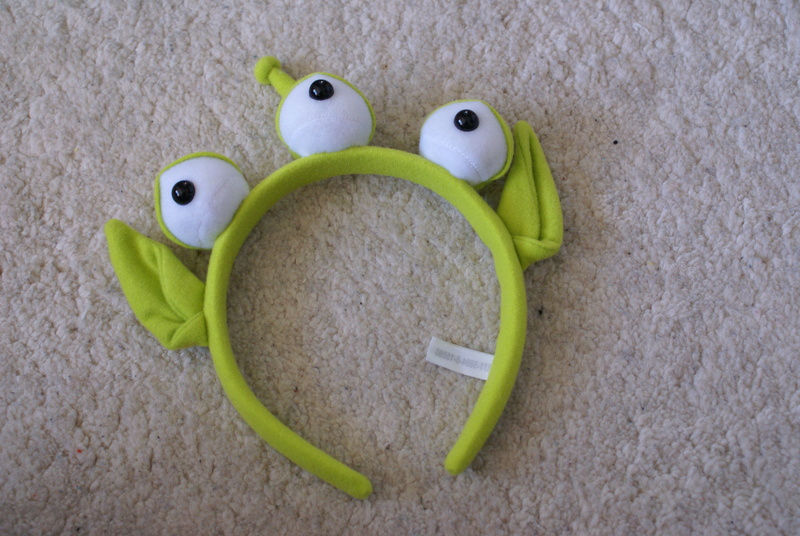 A lot of people in the parks choose to wear clip-on ears, and they came in a pretty impressive range from Minnie to Pooh to Stitch. 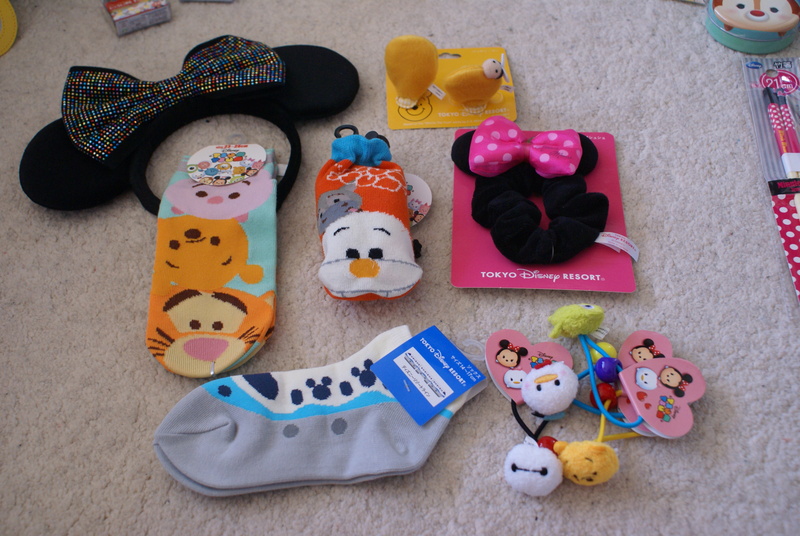 I picked up some Tsum Tsum hairbands from the Disney Store just outside the parks, and the Tsum Tsum socks came from some crazy shops we found in a Tokyo shopping centre. 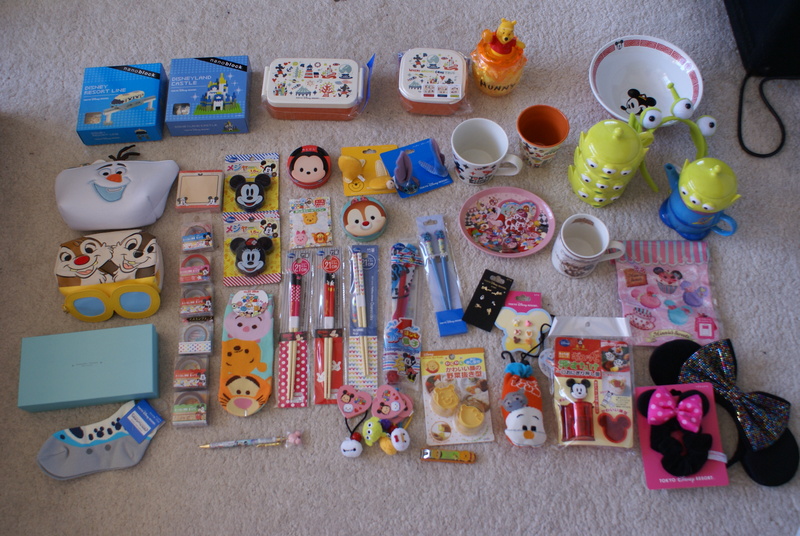 As we all know I’m a total homeware nut, and I honestly expected more of it in the parks but the range didn’t span much more than mugs and chopsticks in most places, but I did manage to get some cute lunchboxes, a large rice bowl and a plastic cup, as well as a Tokyo Disney mug and a Tokyo Disneyland hotel mug to add to my collection, as well as some Winnie the Pooh nail clippers – random, I know – and The Queen of Hearts plate came with one of our desserts in the Queen of Hearts Banquet Hall. 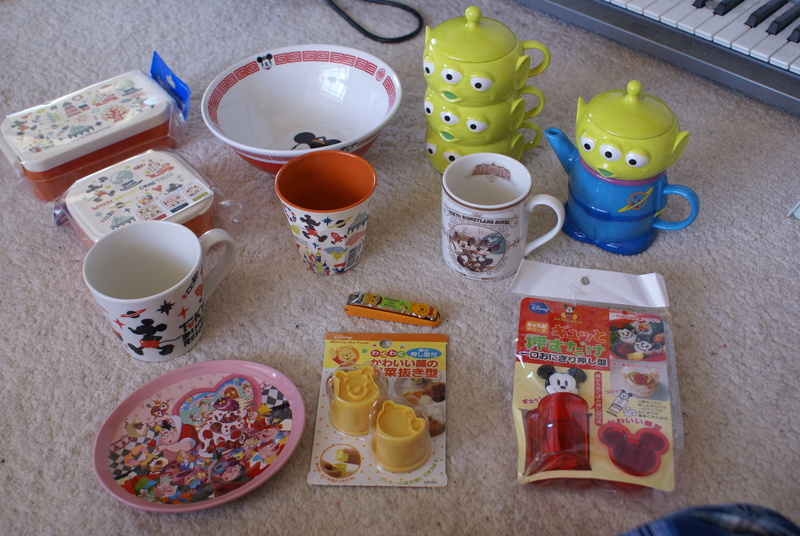 From another store in Tokyo I also got some cool Pooh and Mickey sushi mould sets, as well as my favourite buy of the holiday: a Toy Story Little Green Men tea set! I had really hoped to get a tea set while in Japan, and this little guy stole my heart. 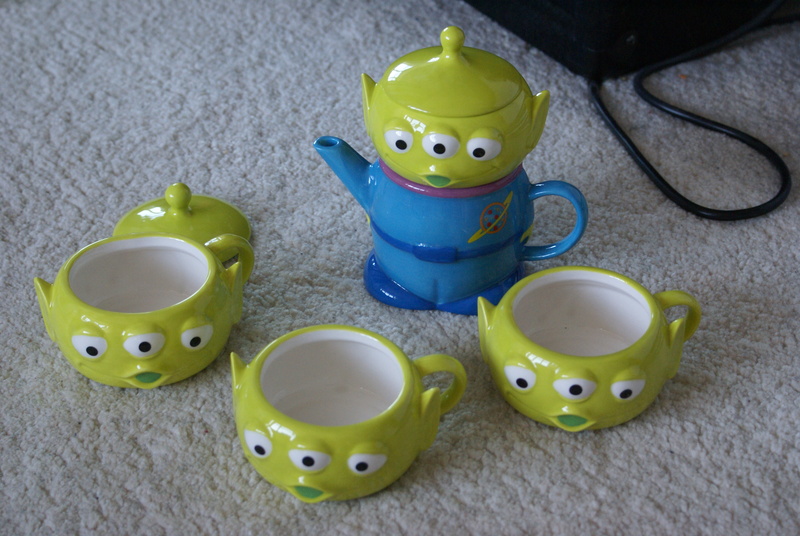 As you can see in the top picture, the cups all stack up into a tower, and the head lifts off the teapot to act as another cup/sugar bowl, while the body is the pot; I’m in love! 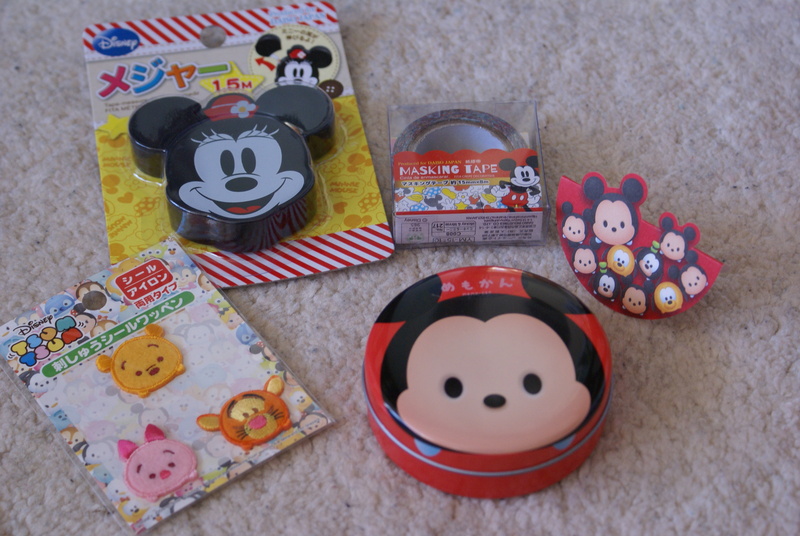 I also picked up a few crafty bits from various stores around Japan: a Minnie Mouse tape measure, some Disney washi tape, sew on Tsum Tsum appliques and a tin of little paper tsum tsum cards! As well as all these wonderful goodies, there is one more beautiful buy, which I’ve snuck a picture of as its going to be my birthday present, so I can’t have it until October (waa! 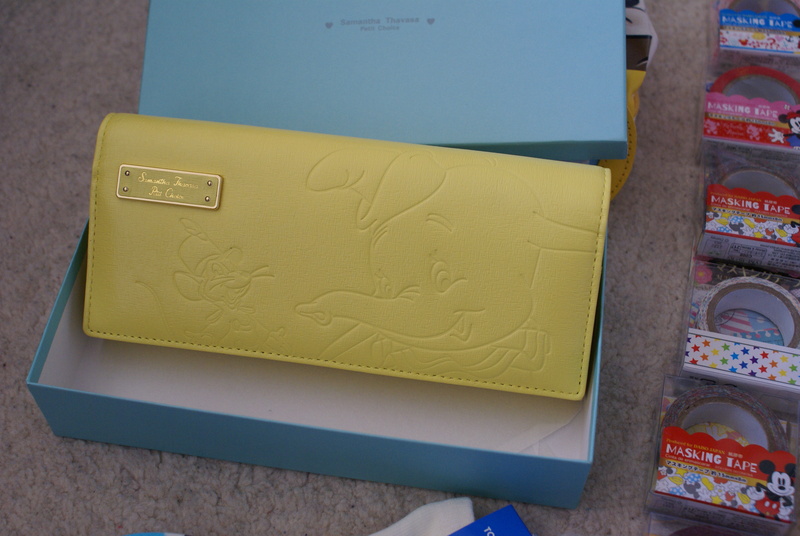 ), but I have to share..
We came across a Samantha Thavasa store in a shopping centre and I just wanted to have a quick look until I found this beautiful Dumbo purse – the picture doesn’t do justice to just how gorgeous it is! I’m a pretty happy girly! 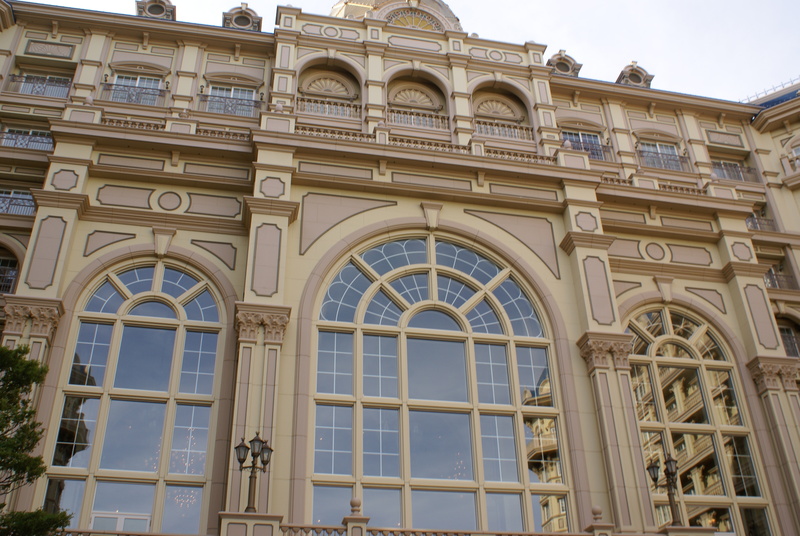 Following our early night, we were up bright and early to hop on the monorail round to DisneySea to utilise our ‘Magic 15’ tickets, giving us early entry to the park, and while some may sneer at the mere 15 minutes extra we were given, it was totally necessary! 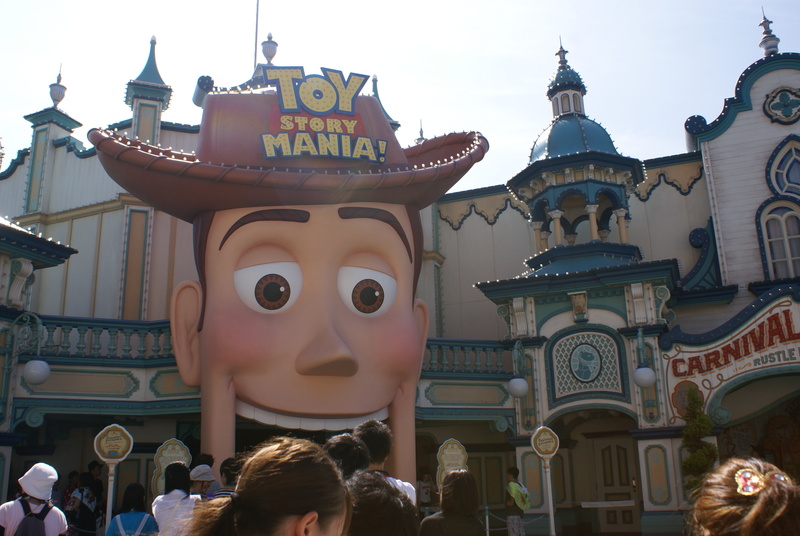 We headed straight for Toy Story Mania as we knew how ridiculous queues could get, and sure enough, even getting in early gave us a half an hour wait! Knowing how many people would charge our way at park opening, I ducked out of the line for a second to nip across to Tower of Terror (which is right next to Toy Story Mania) to pick us up Fastpasses as I knew that it would also have a crazy wait time after later on, and while I was at it, the park opened and the hoards descended! 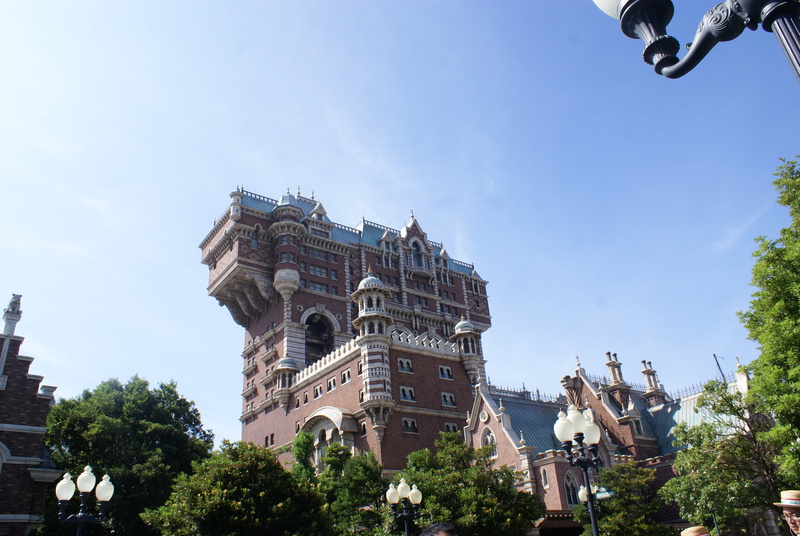 With the two big’uns sorted, we continued on around DisneySea. Now you might be thinking ‘that’s an unusual park name’, right? Well it’s a totally unique park! 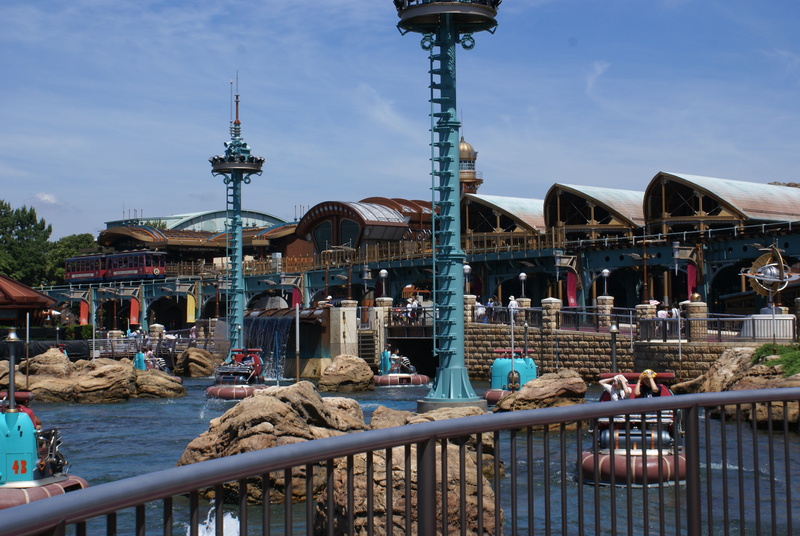 From American Waterfront, which has a sort of Streets of America feel to it, with a huge classic cruise liner docked at the pier, we moved round to Port Discovery, which has a futuristic feel, then into the Lost River Delta. 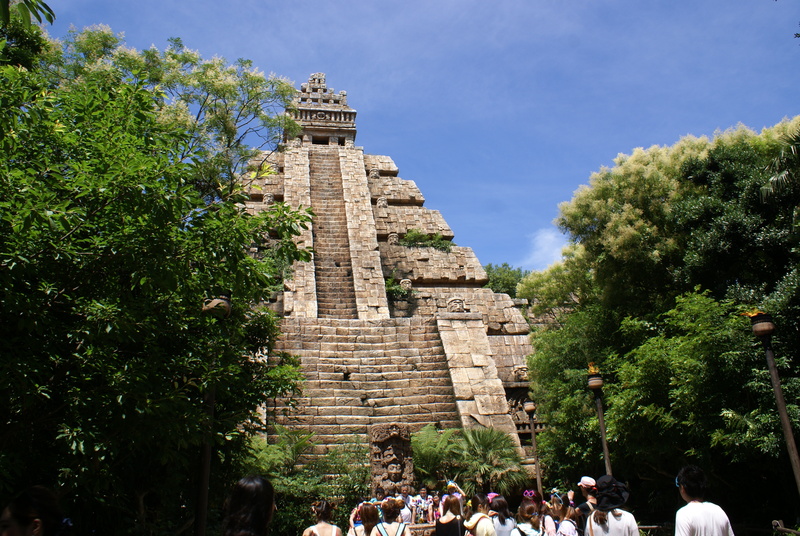 In a very Epcot World Showcase crossed with Animal Kingdom kind of way, this area houses the Indiana Jones ride, set in a huge Incan temple, and the roller coaster Raging Spirits, which we didn’t fancy due to the full loop! 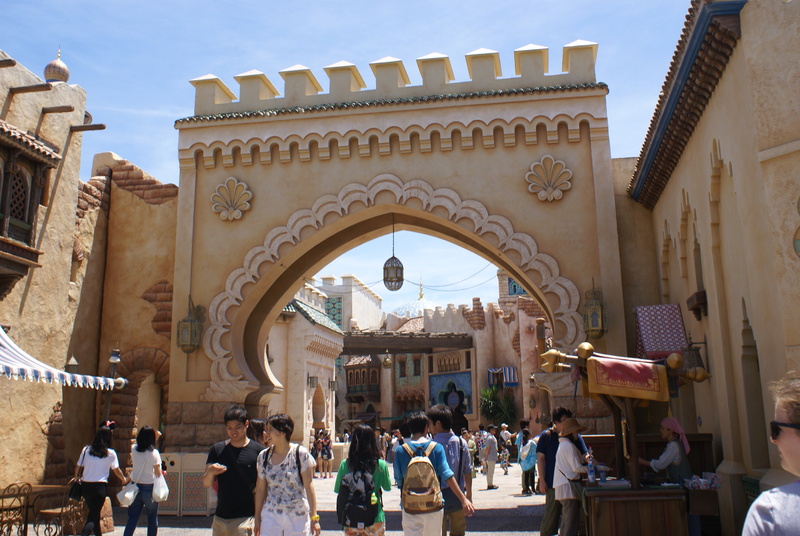 From there we moved on to the Arabian Coast, an entire land that is basically Agrabah, with all Aladdin themed rides and scenery, including the Caravan Carousel, which is double decker! 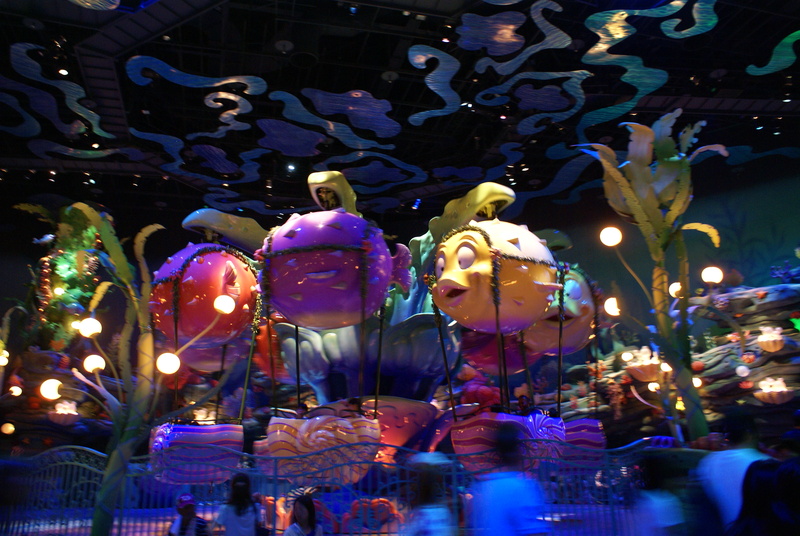 We moved from area to area pretty speedily due to following our empty stomachs to find somewhere to eat, and from Arabian Coast we went into the Mermaid Lagoon. 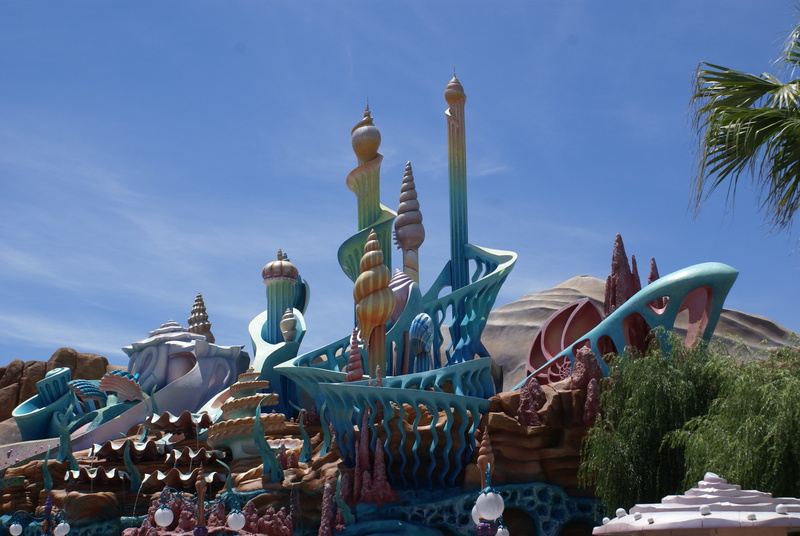 From the outside, you see a few rides, and then the huge underwater palace of King Triton from the Little Mermaid, but follow the path under the rocks, and you enter the kingdom of Atlantica itself! There’s a whole under the sea area with rides, a theatre and Sebastian’s Calypso Kitchen, which is where we settled down to some food before continuing on through the park. 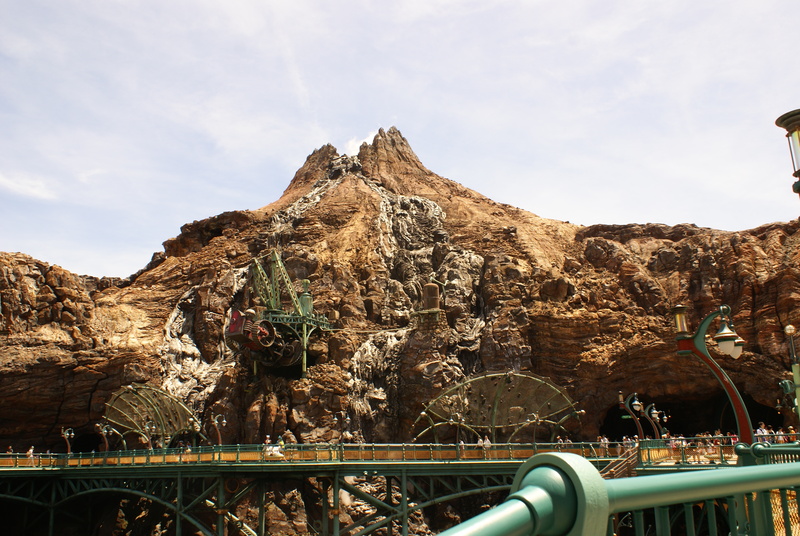 Another of the parks unique features is the enormous volcano at its centre, which is constantly active, spewing smoke and glowing with magma. 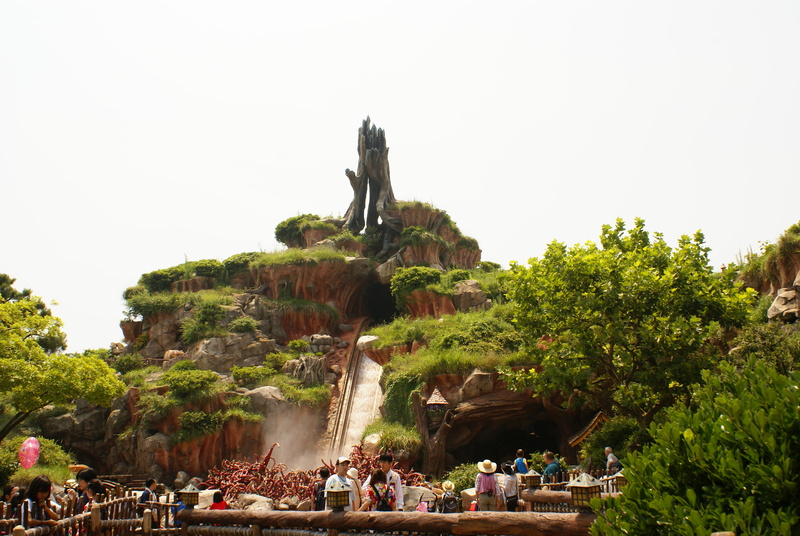 It houses two rides, a submarine style ride, 20,000 Leagues Under the Sea, which runs through the pools underneath the volcano, and Journey to the Centre of the Earth, during which you travel down into the earth under the volcano, before spiralling up and speeding back down the side, to a great view of the park! By this point in the day it was getting pretty hot, so we grabbed an ice lolly on the bridge across to the Mediterranean Harbour area, and it just so happened that a show was just about to begin, so we found a spot to watch from. Minnie’s Tropical Splash was kind of like a boat parade, with some characters making their way off the boats and into the crowded audience to dance and spray water around, and by that I mean totally and utterly soak everyone in the ‘get wet’ zones. 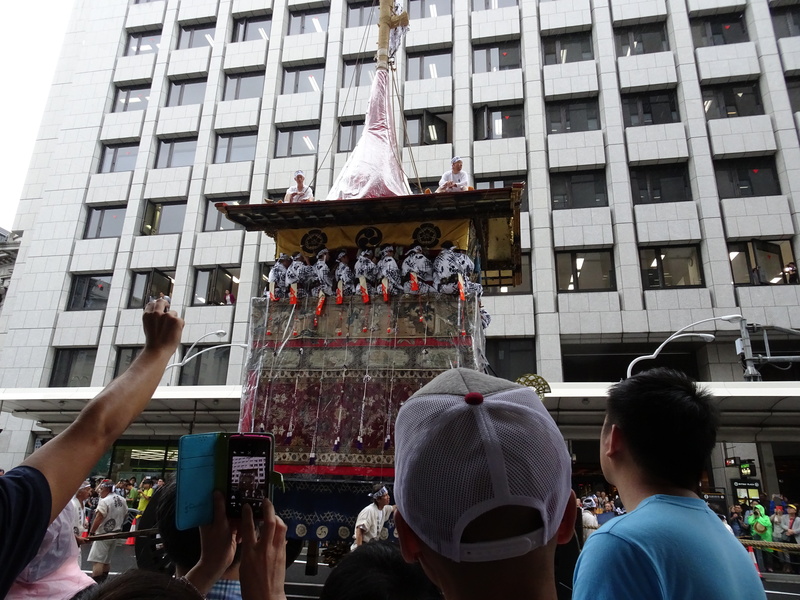 Each of the boats also had water cannons, and they were very liberal with the spraying! 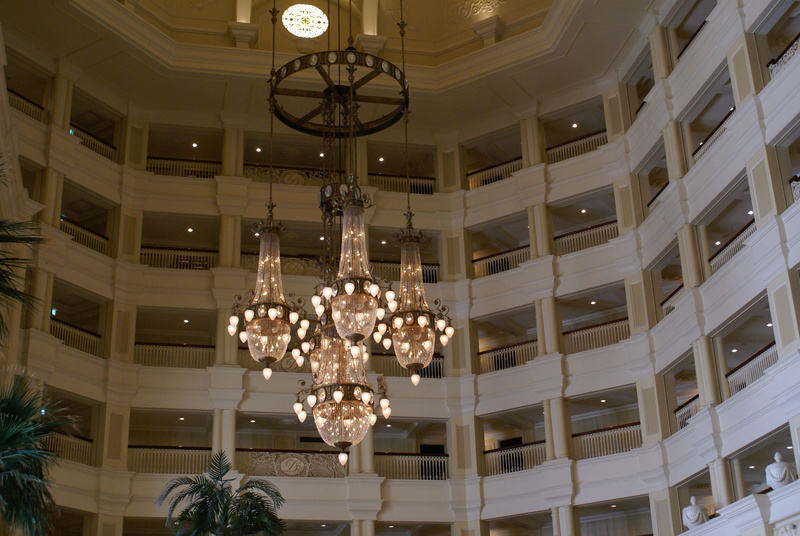 With the jet lag still slowing us down, we decided to head back to the hotel for a little bit, before monorailling back into the park for Fantasmic. Shows and parades are taken pretty seriously out here, with people being allowed to stake their claim of a good spot an hour beforehand, so we got in about 40 minutes before the start, and found a patch behind an empty priority seating area, knowing that there wouldn’t be too many people in front. 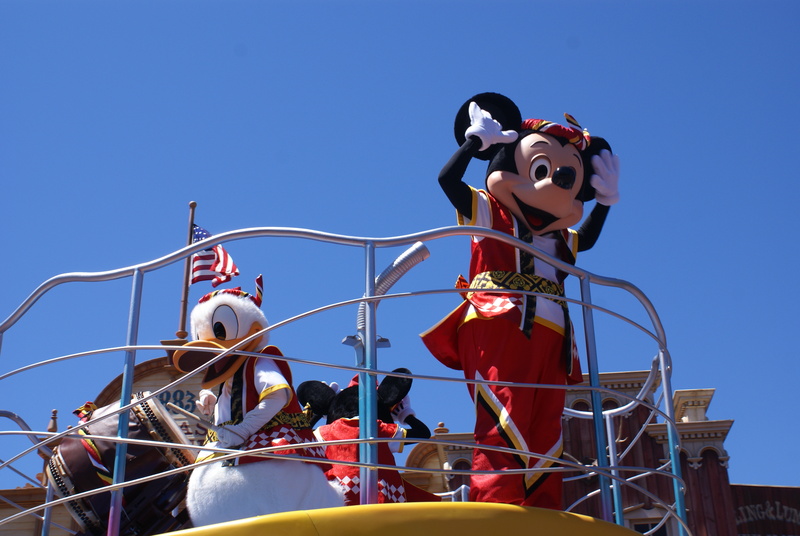 As an added plus, the cast members ask all guests to remove any hats or Mickey ears so as not to block the views of those behind, which was great! 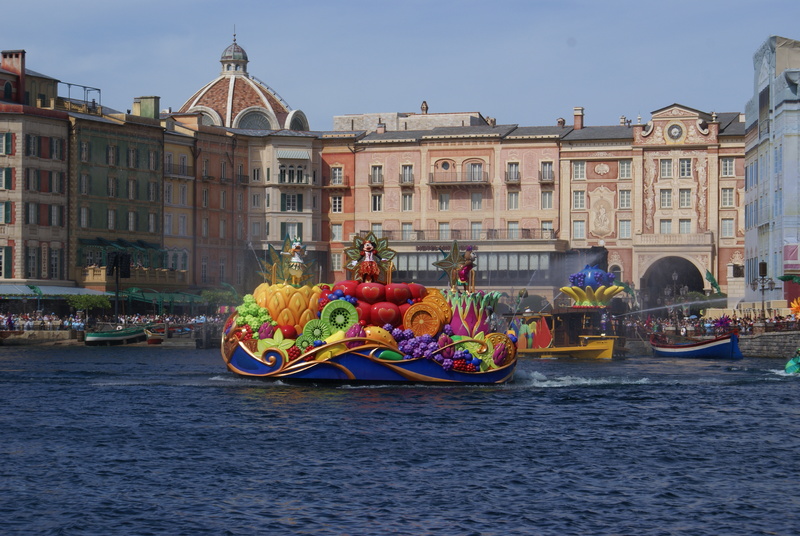 The show itself was set on the main lake of the Mediterranean Harbour, unlike in Disney World where it has its own set, so it was all done on a central floating stage, that could transform into Mickey’s Magic hat, covered in LEDs to show clips from Disney classics, and also have characters stood on top. 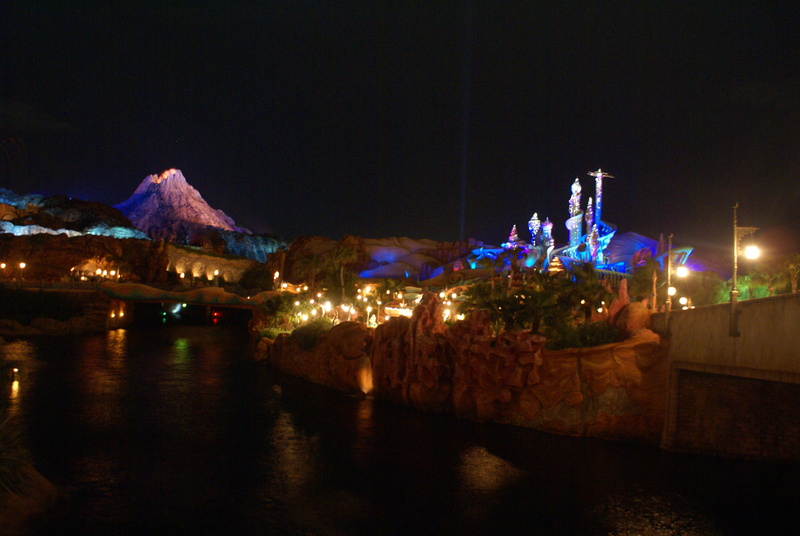 Maleficent appeared out of another floating contraption, setting fire to the water, with the volcano firing away in the background, and for the finale, the boats of characters circled the central hat. Unfortunately due to windy conditions there were no fireworks, but they made up for that with lights and lasers which were pretty spectacular! 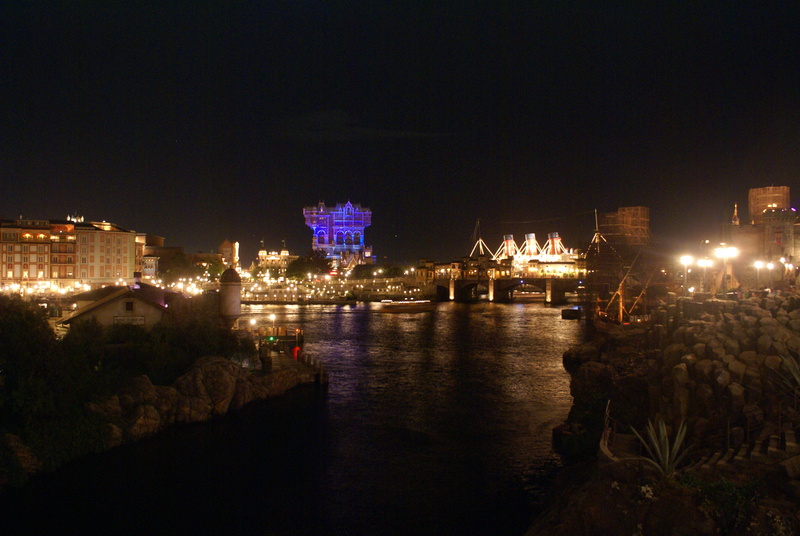 With most people filing out of the park at this time, we jumped on the DisneySea Electric Railway, which runs from the American Waterfront to Port Discovery to see the park all lit up for the night, and wandered back through to Mermaid Lagoon to do a few smaller rides while they were quiet. By this point everyone else was pretty exhausted, so headed back to the hotel, but I wanted to stick it out til park closing so I flew solo for the last hour, hitting up Magic Lamp Theater (with English subtitles), which was just a short pantomime/3D show, before meandering back through the park to get some evening photos and do a little shopping before jumping on the monorail back to the hotel! 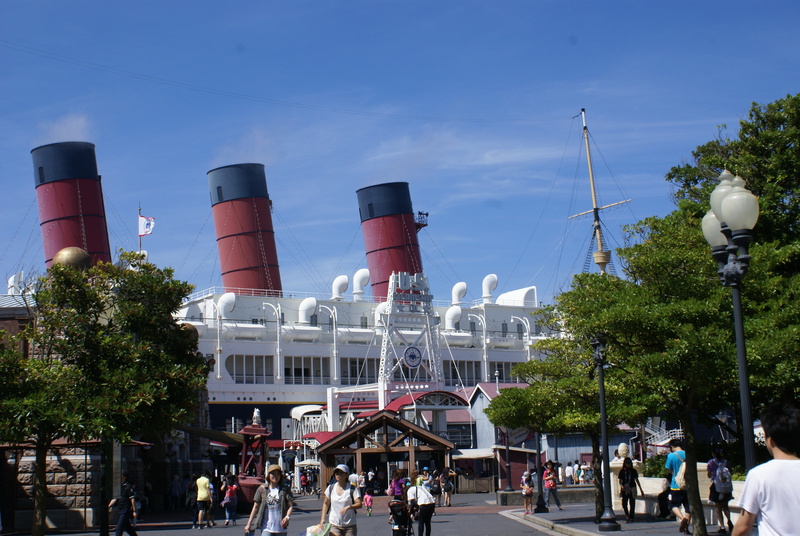 DisneySea really is a fantastic park! 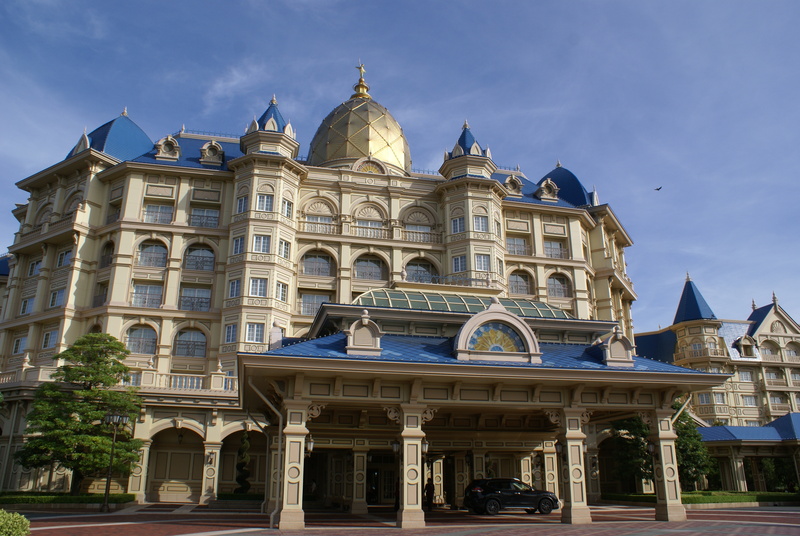 So after almost 26 straight hours of travelling, we finally arrived at Tokyo Disneyland Hotel just after 12.30am Sunday morning. I was totally and utterly exhausted, and unfortunately it had all taken a toll on my poor little body, and after just two short hours of sleep I was awake again with stomach pains, and promptly spent the next few hours feeling rough as hell, and heartbroken at the thought of being too ill to head into the park for opening. Fortunately, it didn’t take too long for my system to flush (if you get my drift! ), I scraped a little extra nap and we got straight down to business! 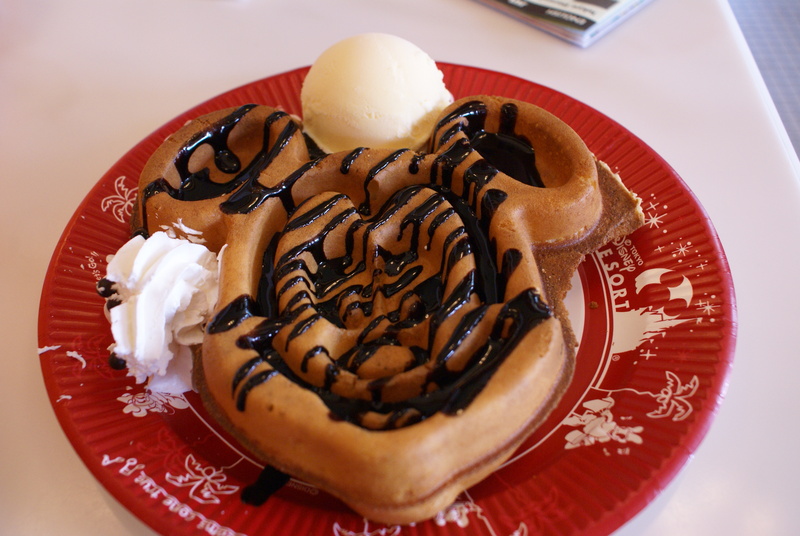 So we’re staying at the Tokyo Disneyland Hotel, which is literally 100m walk from the entrance to Tokyo Disneyland (and also the monorail station that connects us to DisneySea), so we were in the park within minutes, and first priority was breakfast, so we hit up The Great American Waffle Co. in the World Bazaar before starting our park exploration. 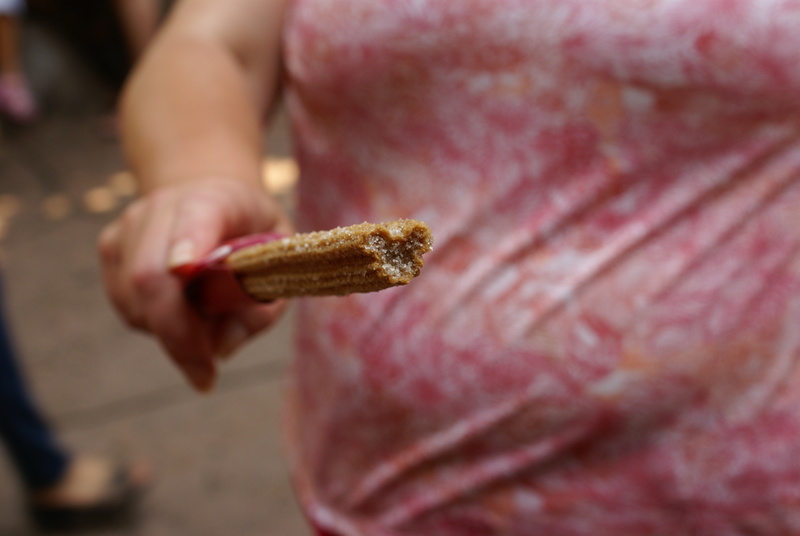 Naturally, as we were out that way, Pirates of the Caribbean was our first ride, and from there we worked around the park clockwise: Adventureland to Frontierland, to Critter County for Splash Mountain followed by a quick Mickey churro before continuing on to Fantasyland and onwards. Still running on definitely not enough sleep as a family, we began to flag early afternoon, so we sat down to eat at Queen of Hearts Banquet Hall, a restaurant I’d read about while researching the trip and was desperate to try, and it did not disappoint! 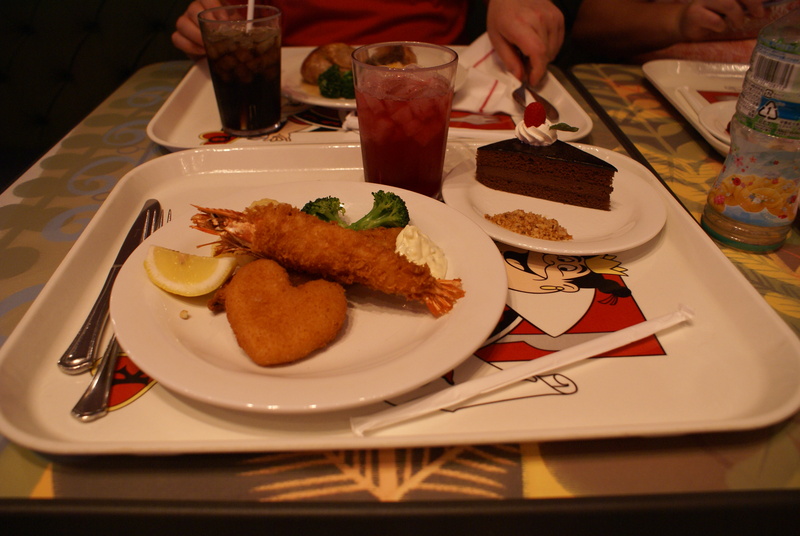 Food was on point, theming was on point; we were impressed. At this point, we decided to take the rest of the day fairly easy; we were tired, feet were sore, so we opted to finish up the main rides, watch the Dreamlights Electrical Parade, which we did nomming on a Mickey burger (the bomb), and call it a night so we can get a head start on DisneySea in the morning! 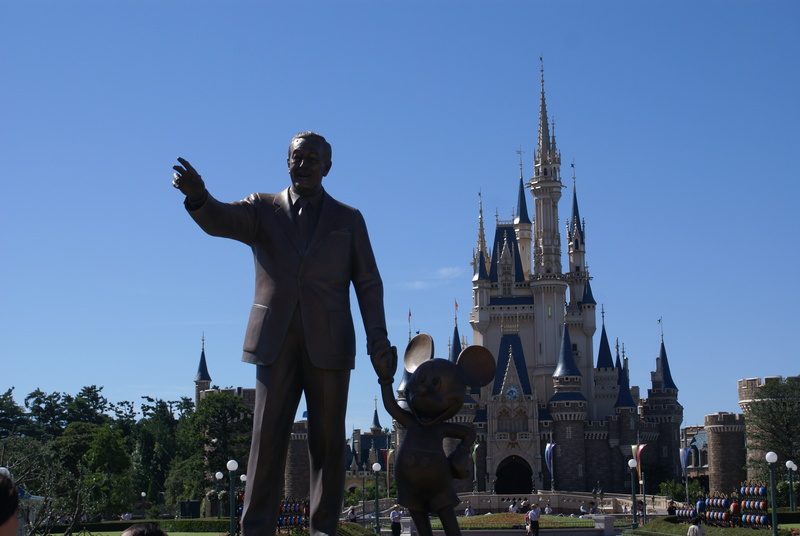 This week I’m starting to get my Disney buzz back as our Tokyo trip is less than 3 months away, so we’re starting to get into details like itineraries and booking hotels, and also because with sign up a week away, Dad and I are starting to make our arrangements for our Run Disney trip in January. 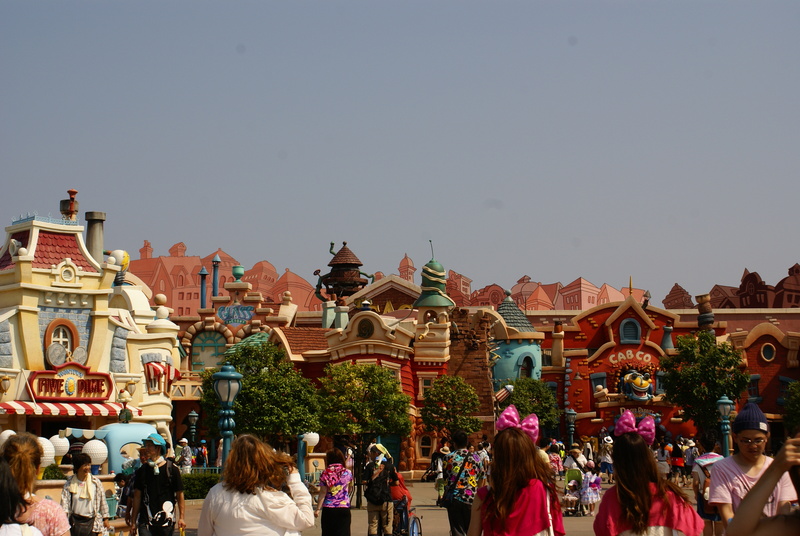 So as far as Tokyo Disneyland goes, its totally un-chartered territory for us. 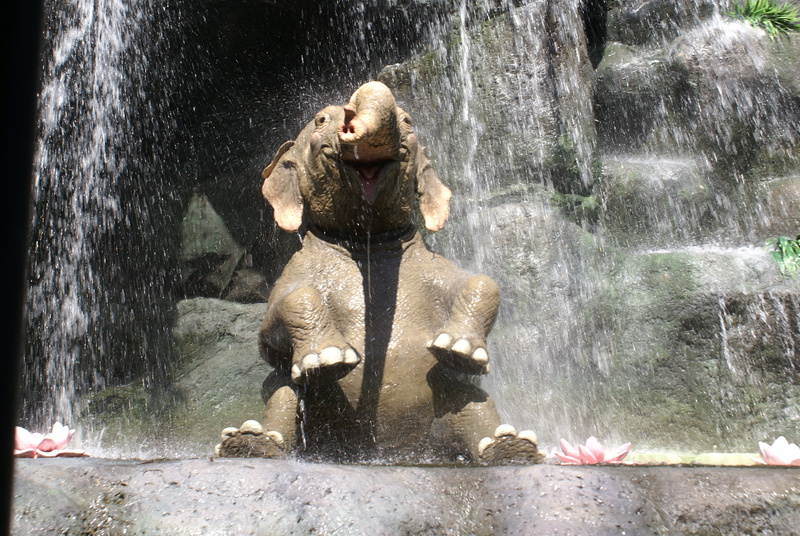 Planning-wise, my expertise are in Disney World, so I really am a fish out of water, which is exciting and a little scary for me as I’m terrified of not being able to fit everything into the 3 days we’ve got set aside for the parks. 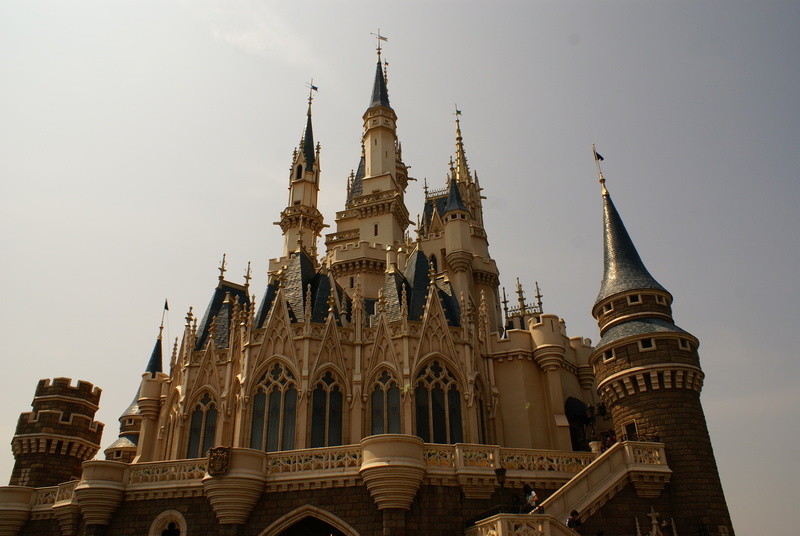 Now I’m very much a DIY person, and have never been one to turn to guidebooks for advice, but in this instance I decided to, so I bought two – Top Tips for Visiting Tokyo Disney Resort, and Elijah’s Ultimate Guide to Tokyo Disney Resort 2015 – just to be on the safe side! Quite honestly, I chose them because they were the first options that came up on my Amazon search, but I’m pretty happy with my choices having them read through them; they both cover different things which is ideal. Top Tips is very much a planning guide, which covers everything from picking a hotel to useful Japanese phrases. 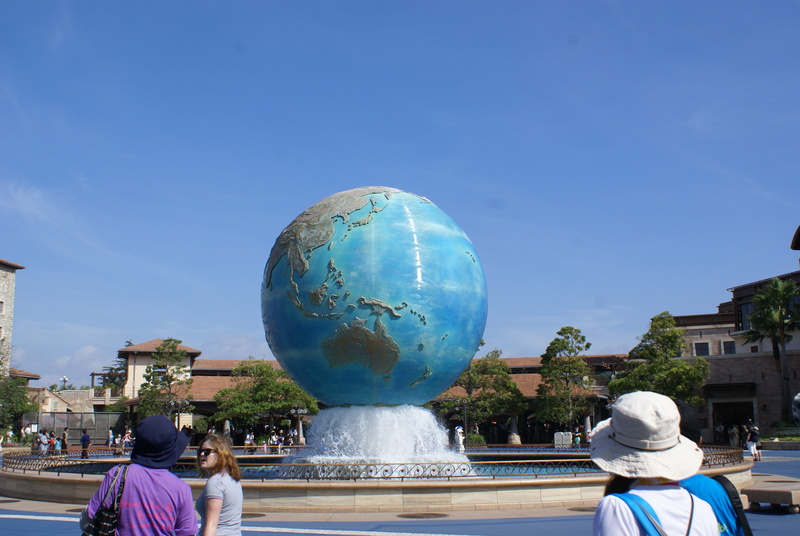 Its full of great information on the important park stuff like Fastpasses, dining, transport and shopping; for a little book its packed to bursting! 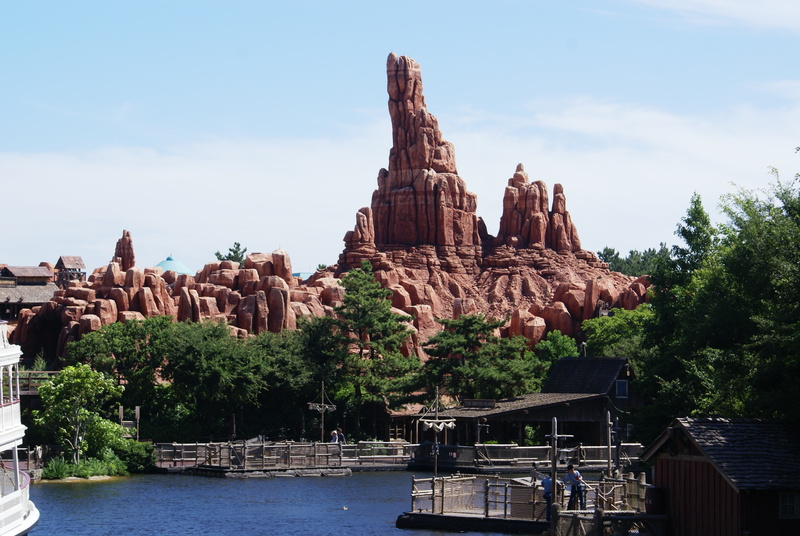 Elijah’s Guide is more of a breakdown of the parks: rides, restaurants etc. 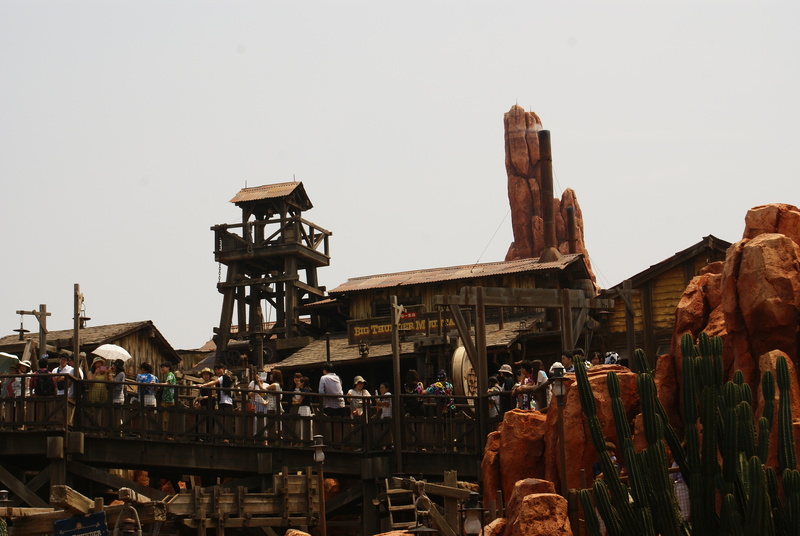 It covers a little about choosing when to visit the parks and other planning basics, and then launches into a blow by blow review of each attraction. It splits everything into its area (Disneyland>Area>Attractions/Restaurants/Shops>individual reviews) and Elijah gives every attraction a rating, a bit of information (when it opened, who its aimed for etc) and a short description. Our main issue at the moment however is the language barrier. 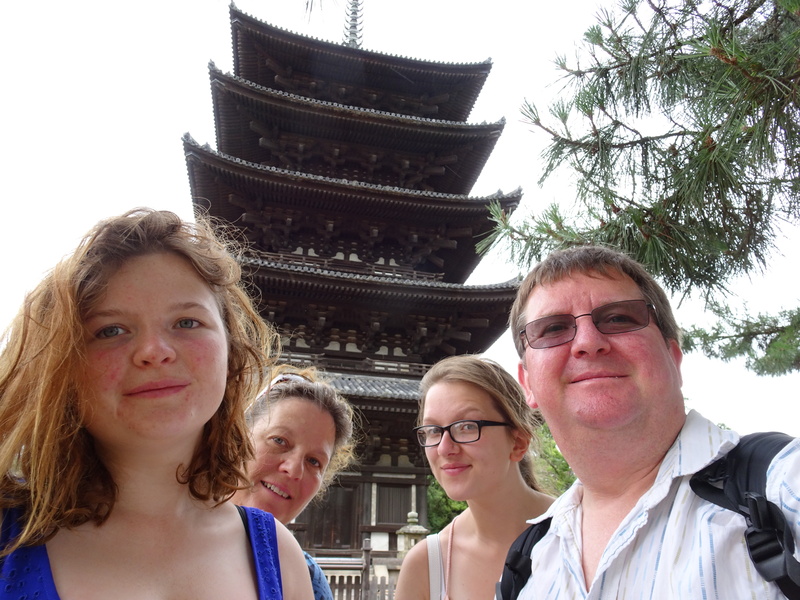 While you may not think it, speaking English isn’t a priority for the Japanese, so we’re struggling to book hotels as not all the staff at the other end of the phone are capable of understanding my dad.. We’ll work it out though! Dad and I booked our flights for January today! Eeeek! I am so excited. Now we’ve booked flights, we know how long we’ve got in each place, which means planning can begin! We’ve yet to pick and book our Florida resort to stay at as we’re waiting to see if we’re booking through the Run Disney travel company, or just directly through Disney, but by the end of the week we’ll have a plan and right now we’re in no rush to worry about the California leg of the trip just yet, but I am BUZZED. This is happening, stay tuned for more! So I’ve strayed from routine posting once again this week, but I have a valid reason, promise! 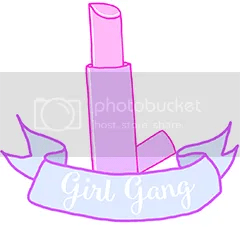 This week, as well as having to work overtime at work, I’m spending my precious free time working with a couple of different brands on upcoming posts and competitions. That’s right! By the end of this week we will be hosting our very first brand sponsored competition, with a great haul of goodies, so stay tuned for more! 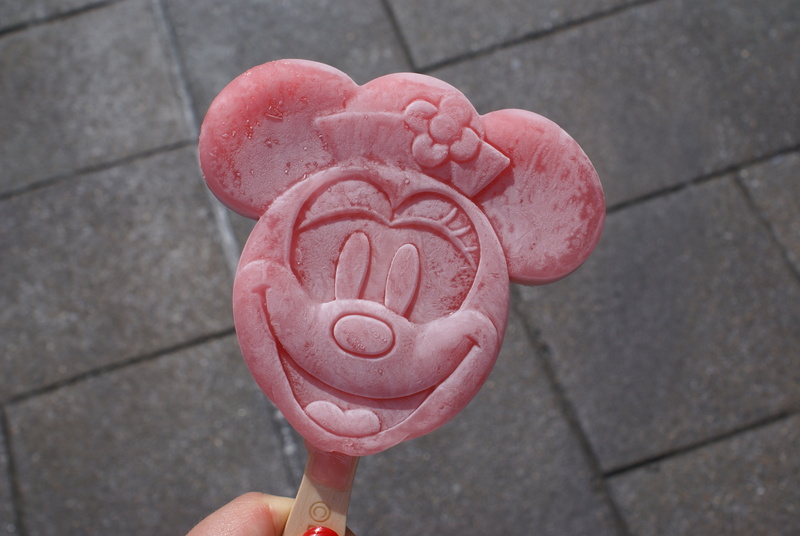 Fret not, usual scheduling will return next week, as well as some more Disney World Tips and Secrets as I take on covering Downtown Disney and Caribbean Beach Resort. 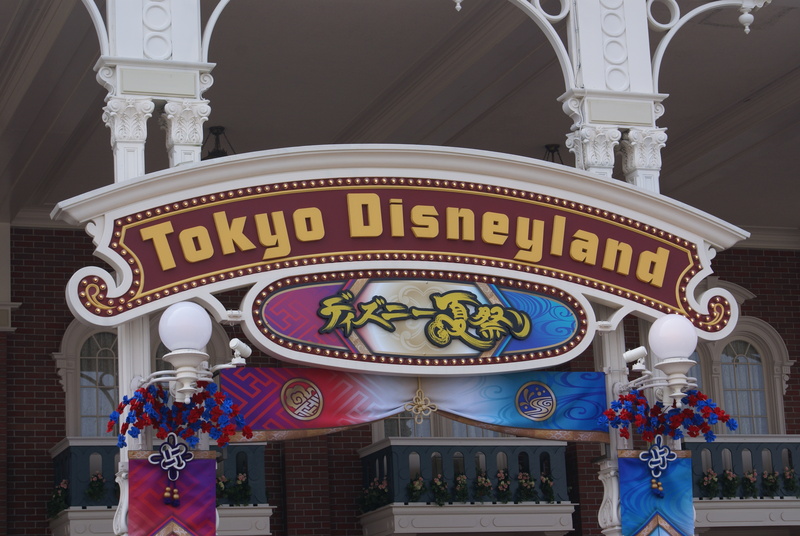 I’m suffering major park withdrawal symptoms at the moment, so in an attempt to cheer myself up I’m looking forward to our upcoming Tokyo Disney trip, and will begin research and planning!